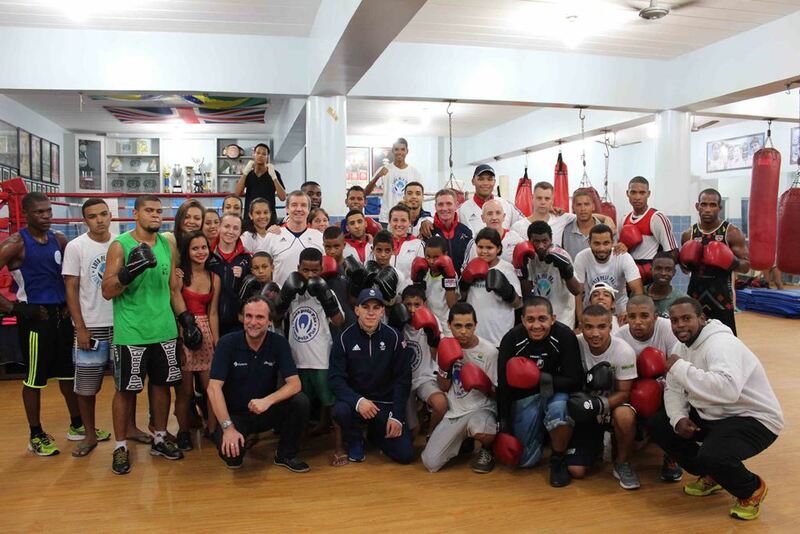 As part of their trip to Brazil for the Olympic Boxing Test Event, boxers on the GB Boxing squad enjoyed a visit to the Fight for Peace Academy in Rio de Janeiro. Fight for Peace is a charity based in London and Rio, which combines boxing with education and personal development to realise the potential of young people in communities affected by crime, violence and social exclusion. The squad was invited to discover more about Fight for Peace by meeting young people and coaches at its Academy in Complexo da Maré, a complex of favelas in Rio de Janeiro’s North Zone. They were treated to a presentation about the group and its work, and with the help of interpreters, took part in a question and answer session with youth leaders. Later on, they put boxers at the Academy through their paces with a fun session on the pads. The trip was a chance for the team to experience a different side to Rio, and witness the importance of sport in helping bring communities together and save young people from lives of violence. GB Boxing hopes to continue to develop its relationship with Fight for Peace. When the team faced their Brazilian opponents at the Olympic Test Event, a large crowd of supporters representing Fight for Peace came to support and cheer on their British rivals.